How much do we love catering? Let us count the ways. We love catering your wedding, Bar Mitzvah, going away, coming home, new home loan and mortgage retirement. We’ll cater your personal retirement, new hires, corporate retreat, company outing, client meeting and officer offsite. You name the time and place, and we’ll stuff you so full of delicious, artisanal food, you’ll feel like a piñata ready for beating. As purveyors of fine food, wine and cheese, we invite you to consider us in helping you create the menu for your next social gathering. & lemon dressing $3.99 p.p. Spinach – Fresh peppery spinach with bacon, shaved red onions, homemade croutons, hard boiled eggs and a red wine dressing $3.99 p.p. Chef Salad – A bed of green leaf lettuce with hard boiled eggs, turkey, Beachwood smoked ham, provolone cheese, grape tomatoes and cucumbers with a white wine dressing $3.99 p.p. 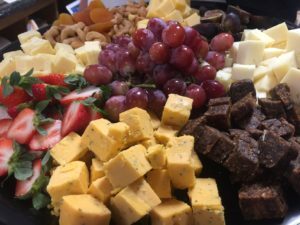 Cheese Platters – A selection of four to six perfectly aged international & domestic cheeses beautifully garnished and served with an assortment of bread and crackers $5-7 p.p. bread & crackers. $7.00 p.p. Sandwich Platter – Choose an assortment from our menu of favorites or create your own selection. $8.00 p.p. Antipasti Platter – A delicious selection of different styles of antipasti served with an assortment of bread & crackers. $7.00 p.p. Cookie & Pastry Sampler – An assortment of cookies, brownies and petit fours to complete your meal. $3.50 p.p.